Have the mighty fallen? Will the Billions TV show be cancelled or renewed for a third season on Showtime? The television vulture is watching all the latest cancellation and renewal news, so this page is the place to track the status of Billions season three. Bookmark it, or subscribe for the latest updates. Remember, the television vulture is watching your shows. Are you? Airing on the Showtime premium cable channel, the Billions TV show stars Damian Lewis, Paul Giamatti, Maggie Siff, Malin Åkerman, Toby Leonard Moore, David Costabile, and Condola Rashād. Eric Bogosian will recur and Mary Louise Parker will guest star in season two. Billions follows U.S. Attorney Chuck Rhoades (Giamatti) and self-made billionaire Bobby Axelrod (Lewis). The second installment picks up right after the season one finale, which ended in a confrontation between Rhoades and hedge fund king “Axe.” Now, the duo will engage in a “scorched-earth battle” to retain power. With dueling investigations dogging Chuck and Bobby, Showtime says both men will face a “full frontal assault that will force them to reconsider everything and everyone.” Meanwhile, Wendy (Siff) finds herself newly independent, while Lara (Åkerman) fights to keep her marriage and family safe and thriving. The second season of Billions averaged a 0.26 rating in the 18-49 demographic and 880,000 viewers. Compared to season one, that’s down by 23% in the demo and down by 20% in viewership. Learn how Billions stacks up against other Showtime TV shows. On March 8, 2017, Billions was renewed for a third season which will debut March 25, 2018. Stay tuned for further updates. 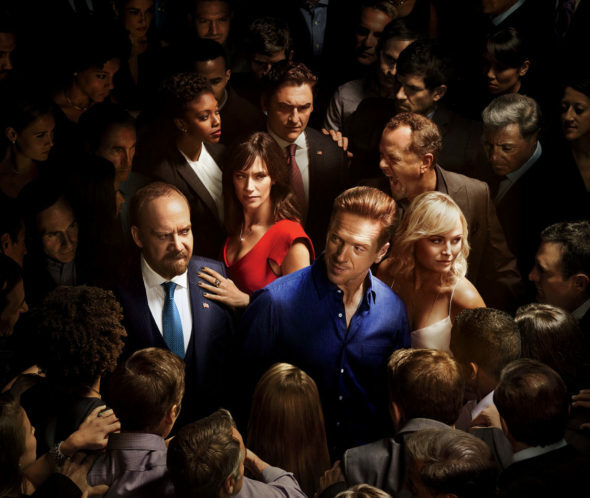 In its first season, Billions was a top five show for Showtime. While the series is still one of the cable channel’s top-rated shows in season two, the numbers have come down. Showtime doesn’t depend on advertising like commercial channels but they do need to make programming that their audience is willing to pay to see. Once the ratings rose on for episode 2.03, Showtime renewed Billions for season three. I’ll still keep an eye on the ratings and update this page, periodically. After all, even renewals can be cancelled. Subscribe to be notified of Billions cancellation and renewal news. 3/8 update: Showtime has renewed Billions for season three. Details here. TV show ratings are still important. Follow Billions’ weekly ups and downs. What do you think? Should the Billions TV show be cancelled or renewed for season three? How long would you like this Showtime TV series to last? Love the show. Don’t cancel…please. Fantastic show. One of the best in years! Looking forward to Series 3. This show is fantastic! It has all the right combination of a clever writing, interesting, must see ingredients! Is the highlight of my week? Can’t wait for season 3! I LOVE the show. I’d like it to go at least 5 or six seasons at the least! Can’t wait for Season 3! Incredible writing, fantastic acting! Love the tension between all the characters! Thank you for a great show! Billions is a great show. Me and my wife watch the show every week. Please do not cancel. I love Showtime’s Billions! The characters are fascinating, changing and not always predictable.